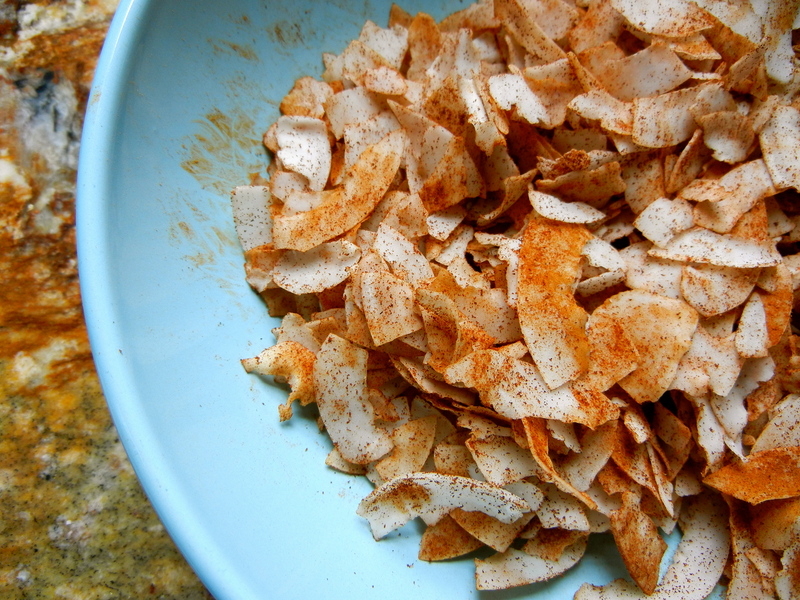 If you love coconut and crunch you will love these cinnamon coconut chips! Coconut is a life saver on the GAPS diet. You can make it into flour, sugar, flakes, chips, chips, oil, milk, and cream! Am I missing anything? Cinnamon coconut chips were born..
Well I came across these big coconut flakes at my coop, and immediately my wheels started turning! They are also known as coconut chips, which is a perfect name for them. At my house, you cannot go wrong with cinnamon. It turned out to be the perfect combination! The GAPS diet lacks that crunch that you might have had before starting the diet. These coconut chips will really satisfy your crunchy craving. There are endless flavor combinations for these chips. When my sisters tried these, they said they tasted like cinnamon potato chips and without the cinnamon they would take just like potato chips! The coconut flavor turns into a more toasted flavor after it cooks. Yum! They cook VERY fast, so 3 minutes is the maximum! You are better off just standing by your oven with your mitt ready. Cinnamon is high in calcium, manganese, and fiber. While raw coconut is high in protein and minerals! Remember coconuts grow by the sea. This is actually a super food snack, so nibble away! I know that stevia and xylitol are not GAPS legal, but I never did well with honey, so I use stevia. My younger sister (who is not on the GAPS diet) doesn’t like stevia, so I decided to use xylitol because it is in granule form. Coconut sugar would work as well. Though if you don’t have a big sweet tooth, you may not need any sweetener. Here are some flavor combinations for you to try as well. Each flavor combination is for a recipe that calls for 2 cups of coconut chips. 2. Measure out 2 cups of coconut chips into a bowl. 3. Pour cinnamon onto the chips. 4. Add salt (optional) and sugar. Lets get a close up…mmm. 5. Toss together with your hands. 6. Lightly oil your baking pan with coconut oil, whip off excess oil with a paper towel. 7. Spread out onto baking sheet and bake for 2-3 minutes. (Shaking it spreads it out easily). Give it a shake or a rough toss after 1 -1.5 minutes. WATCH the coconut like a watch dog! They will burn within a few seconds if you over do it. Do you see that the coconut gets nice and golden/toasty looking, especially around the edges? 8. Take out of the oven. Let cool for a few minutes and then put into a bowl. 9. These will keep for a long time…but I don’t think they will last long around your house either 🙂 Enjoy and have fun experimenting with flavors! I is! i bet it would be good cereal as well! What a great snack, I just love this combination of flavor. Hope you are having a great week and thank you so much for sharing with Full Plate Thursday. Wow! Another cool recipe! Thanks for sharing! I made these the other day and they were fabulous. So much so that I ate the whole batch … couldn’t stop myself. Then I got a tummy ache (seems too much of even a good thing is still too much). As soon as I figure a strategy for portion control, I’ll make some more. opps 🙂 hehe it happens! maybe separate the batch in small ball jars and keep them like that! Wow! I never thought to do anything like that with them. Great ideas. Will have to try the cinnamon ones for sure. Hey Gutsy, I just wanted to thank you so much for this coconut chip recipe as it’s been such a lifesaver for me as I’m on the GAPS diet and it would be difficult otherwise to satisfy my sweet/salty/crunchy craving. This hits the spot. My favorite flavor combo is definitely the garlic/onion combo. I seriously can’t thank you enough. Love all your reciped BTW! Yes GAPS wil be good for her. Mine have lasted all fall and winter and now spring in a ball jar. just make sure they are all the way dry. ..I’m diabetic…can’t seem to find anywhere how coconut breaks down…as a carb ? ?